From the archives (2008). Small-scale producers of quality wine are enjoying unlimited use of a state-of-the-art wine analyser for under €1,000 a year with associated benefits, including improved knowledge and decision making. The centre of Volnay looks a little deserted as a heavy summer shower dampens the characteristic grey stone walls of this picturesque Côte de Beaune village. If this was the peak production season we would see a lot more activity, especially down at the Hôtel de Ville, where the latest in winemaking technology has been installed to help ensure the success of the prestigious Burgundy vintages. Inside a small office stands a state-of-the-art wine analyser that is used for analysing grape must and wine. The rapid analyser gives local winemakers results in minutes, allowing them to get on with their work, safe in the knowledge that their winemaking decisions are backed by accurate, objective information. The idea was the brainwave of Thiebault Huber, who manages eight hectares of gently sloping vineyards in the heart of the historic winemaking region. He produces 13 wines including three whites, nine reds and one sparkling. Last year’s production was around 40,000 bottles. Thiebault is one of thirty wine producers in the village, many of whom are part of a cooperative company that Thiebault founded in 1996 to help with the purchase and finance of major items of equipment. In 2005, ten of the winemakers got together to purchase the wine analyser made by FOSS, and then arranged to put it in the communal location where they can use it as often as they like. Thiebault explains how information about grapes and wine has always been of critical importance, from the maturity and quality of grapes to the state of wine undergoing a traditionally long fermentation and aging process. Before the analyser arrived, critical periods around harvest and during fermentation were always stressful and he would frequently have to call an oenologist at a nearby laboratory to cross check his decisions. He grew curious about the way the oenologist would say: “I’ll just check with the FOSS” and then come back within a result in a minute or two. This naturally led him to the idea of getting his own analytical instrument. “And so, we bought a FOSS,” he says with a hint of triumph. Originally, Thiebault and his cousin, another producer in the village, looked at the idea of sharing the purchase between them, but even so, the sophisticated ‘WineScan™’ instrument still represented a sizeable outlay for small-scale wine producers. The idea was then presented at a local syndicate meeting where a further eight interested parties grabbed the opportunity to be part of the scheme. Previously, the wine producers in the group were typically paying around €3,000 a year for laboratory services, and the larger producers, with more wines to test, considerably more. In comparison, the new shared analyser costs each of the members €1,000 a year for unlimited usage. Inevitably, the new scheme put a strain on the relationship with the local wine laboratory because the winemakers could do routine testing that used to be a traditional part of the laboratory service. This has now evolved satisfactorily with the winemakers still paying the laboratory for consultancy and the required official analysis for approvals, export and so on. The visiting oenologist occasionally takes a few control samples and all the calibrations for the instrument are the same as those used for one at the laboratory, so everyone is working from the same data. All things considered, the scheme is attractive. “The price for our own analyser is very interesting,” says Thiebault. More and more producers are showing interest in the shared analyser scheme and three more have just joined the group which will reduce the cost to around €900 per year. However, the group has decided on a limit of 15 members. All the producers make a lot of different wines and particularly during harvest and alcoholic fermentation there is a lot of testing to be done. Confidentiality was a major issue at the start because many did not want others to see results for their wine. Their fears proved unfounded and, in any case, the testing actually helps with ongoing knowledge-exchange projects, such as a local study of grape maturation patterns across Côte de Beaune plots, helping everyone to optimise timing of the harvest. “We are all very happy,” says Thiebault of the group that consists of mainly very well established family businesses. The new technology is not a barrier for the users. “Sometimes I am very surprised at the level of knowledge,” he says. “The training provided by FOSS was well executed, and now people have no problem interpreting results, for example, if you get a result of 2.9 for malic acid, it is quite easy to figure out that your malolactic fermentation is not finished.” The analyser is used from harvest to bottling to support all the aspects involved in producing Burgundy wine, as Thiebault enthusiastically explains in relation to the use of Pinot Noir grape. When treated correctly, Pinot Noir can produce highly prized wines that reveal intricate differences of terroir. Grape maturity is critical and routine testing with the analyser helps the Volnay producers to decide the timing of the harvest for particular plots based on results for parameters such as sugar level and acidity. “For me, the alcohol level for Pinot Noir is between 12.5 and 13.5,” says Thiebault. “Above this, it is less elegant because if we are higher, the acidity is lower. All the fresh wine of Burgundy comes from the acidity. It is really important to pick the grapes at the right time and with the right maturity.” Another important point for winemaking with Pinot Noir in the region is that there is a long period of maceration of between 15 and 30 days. During this period, the wine is closely monitored by frequent measurements of parameters such as alcohol, volatile acid and malic acid. The new knowledge afforded by the analyser does not actually change the way wine is made, but it helps the winemakers of Volnay to tackle challenges and ensure that they are doing the right thing at the right time. “We are completely sure that when we put the red wine in barrels there is no sugar and this is important because of control of tighter controls on parameters such as sugar and alcohol,” says Thiebault. “We are calmer because we work with more precision and we get information that we would never get with the old system because we used to limit the amount of tests sent to the laboratory. Now we can analyse as much as we like – down to tests for each barrel if we want to.” This ability to track various stages in more detail is helping to avoid potential problems. Out of a hundred barrels, typically one or two would show problems perhaps with volatile acid suddenly starting to climb for no apparent reason. With the analyser on hand, such events can be monitored and prevented. Thiebault and others in the group can now look back on accumulated results and Thiebault keeps a record for each vintage. He shows us a file of results from 2007 with page after page of printed results listing all the samples and tests. “If we receive a control visit they are very happy to look at this,” he says. The retrospective information helps to build knowledge, for example, the test results from 2007 show a particularly high level of malic acid and lower levels of tatric and other acids. Now that the malolactic fermentation is finished, the general acidity level is quite low, indicating that this vintage is readily drinkable compared to other vintages which traditionally, for Burgundy, need a little time to reach their best. “Of course, there are many other things which will define the drinkability of the 07 vintage, the weather, the tasting and so on, but the WineScan and analysis can help us,” says Thiebault. Information for professional buyers is also valuable, such as, the alcohol level, and often a Sommelier is pleased to receive information about the acidity and the maturity of grapes during the harvest. Even on a rainy day, Volnay has an atmosphere worthy of a film location, and the surrounding landscape has a carefully managed look, long since defined by man’s pursuit of perfect wine. Rows of perfectly-tended vines define the slope from the premier cru plots down to the lesser regions in the valley, while a pleasant musty smell rises from the puddles soaking into the valuable Côte de Beaune earth. 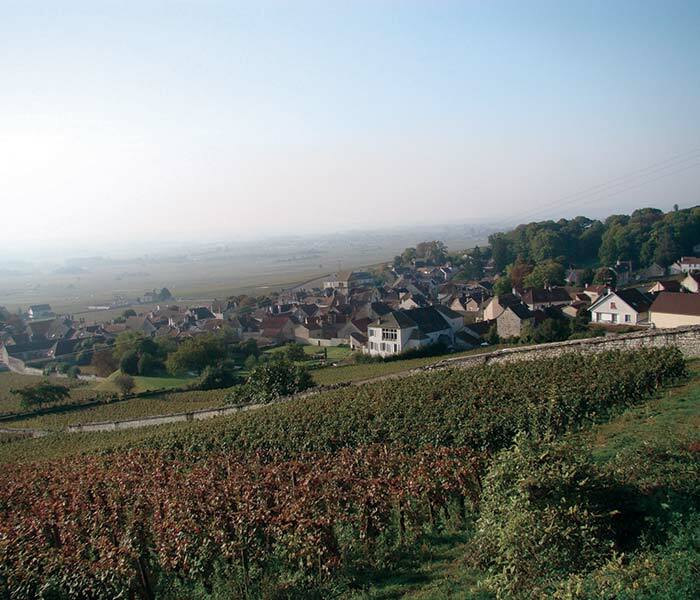 Tradition and terroir will continue as pillars of success for this historic wine region, but improving knowledge through access to technology will play an ever-important role in maintaining the reputation of Burgundy wine. FOSS wine analysis instruments were introduced to the wine industry in 1998 and FOSS has quickly become a leading force in quality control of wine at all stages of production. Through the success of the WineScan™ range, hundreds of wine producers and laboratories across the wine industry have discovered the ability of FOSS instruments to deliver the rapid and accurate results that winemakers demand. FOSS solutions also include OenoFoss™, a simple-to-use instrument that measures main quality parameters of grape must, must under fermentation and wine from a single drop of a single sample. Up to seven parameters can be measured.